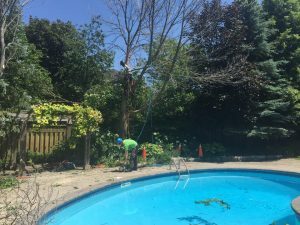 Sequoia TreeScape is the top tree service in Vaughan, providing quality professional tree care from pruning to tree removals. The City of Vaughan has celebrated many milestones since its incorporation in 1850, including an influx of immigration as well as a nearly doubled population between in the past 30 years. Today, Vaughan is home to more than 300,000 people and is York Region’s largest city. Unfortunately, even the fastest growing city is never without its own set of setbacks. One major setback for Vaughan is the ongoing destruction of trees in the area by a variety of uncontrollable forces, be it the 2009 tornado, the 2013 ice storm or the emerald ash borer (EAB). When trees need help, Sequoia TreeScape is here to answer the call. As a full-service provider of professional Vaughan tree service, we are committed to helping you maintain the area’s tree canopy right from your own backyard. Our team is fully equipped with the knowledge and tools to evaluate the scope of care that every tree on your property needs in order to enhance its well-being and maximize its lifespan. Whether your tree requires light pruning, trimming of dead or dying branches or repair following an EAB infestation, you can count on us. In some cases, there is nothing that can be done to a diseased or damaged tree, and leaving it intact poses a threat to surrounding trees, buildings and people. When tree removal is the only viable solution, rest assured that we approach the job with the skill and equipment it requires. We never fail to obtain relevant permits from city officials, and we strive to leave the property exactly as it was prior to the removal. If you seek a top expert to perform tree service at your Vaughan home, look no further than Sequoia TreeScape. Call (416)-770-8733 or complete our online contact form to obtain your free quote today!